7/8 oz. packed 12x36 per case. Haribo Roulettes are as delicious as the long time favorite gummi bears. 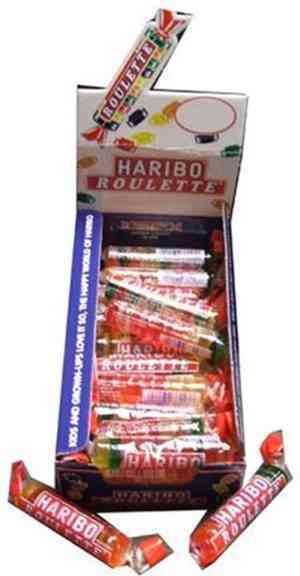 They are just as good as their cousins the mega roulette or the gummi bear. Because they are packaged so handily in a convenient roll, they are very easy to pack for school or a hike. This is another top seller for band, choir, foreign language, or any organization setting out on a fundraising project. The roulettes come in many fruity flavors and colors. They are much softer and tastier than the gum drops one is used to finding here in America.